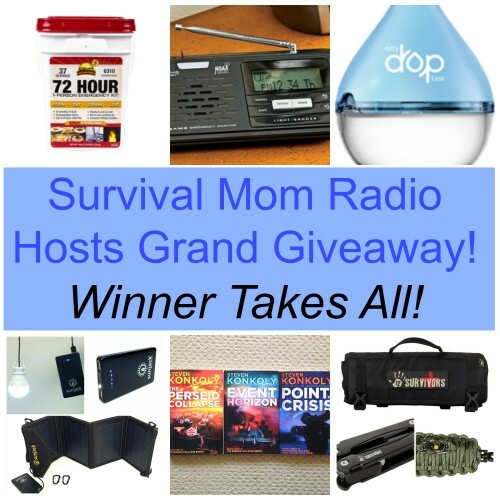 Survival Mom Radio Network Grand Giveaway #1! The Survival Mom Radio Network began from nothing more than a tiny idea into a network of all-women hosts whose shows, just since this past May, have been downloaded nearly 1.4 million times. I’m so thrilled to have been a part of this network from the beginning! To celebrate this milestone and give you something special to get prepared during National Preparedness Month, we have two Grand Giveaways! Both include fantastic prizes worth hundreds of dollars each. Grand Giveaway #1 includes all the basics to get you started in preparedness or beef up the supplies you already have. WINNER TAKES ALL! SunJack is giving away a great prize package worth more than $150. It includes a 14W SunJack solar charger with an 8000mAh battery and a USB CampLight Bulb. Augason Farms has been a long-time sponsor of this blog and our radio network. They have donated a 72 Hour 1-Person Emergency Kit, which is ideal to keep in the trunk of your car, store by the back door if you ever have to evacuate in a hurry, or to give to a college student or senior citizen. All too often, extreme weather events and natural disasters bring with them tainted water. You always want to have a handy, reliable water purifier and Whirlpool’s new EveryDrop Water Filter can filter a gallon of water in just 2 minutes. ProblemSolvers knows that accurate and up to date information is a critical part of being prepared and has donated a Desktop Weather Alert Radio. This radio has an automatic alert system that provides weather alerts specific to your area. 12 Survivors is a brand new company. Their products are creative and designed for multiple survival scenarios. They’ve provided a really terrific prize package of 3 popular products, and you’ll want all of them in your prepper stash. First is their First Aid Rollup Kit. 12 Survivors has also thrown in a creative product we’ve not seen before, a Fish and Fire Emergency Kit. Add a multi-tool and you’re almost ready for anything! Again, from 12 Survivors comes a handy multi-tool, an item that has earned its place in any emergency kit. Keep one of these in your glove box, kitchen drawer, purse, school backpack, and with your camping equipment. All of this, plus a great set of books! Author Steven Konkoly of Jakarta Pandemic fame has donated a set of his series, The Perseid Collapse. This series is getting rave reviews on Amazon and with good reason. All of Steven’s books are well-researched, fast paced, and realistic. I hope you’re feeling like a winner! This entire prize package can be yours and you’ll have many, many different ways to enter this giveaway. We’re using Rafflecopter, since it provides an easy way for multiple entries and automatically selects the winner. The Survival Mom Radio Network is the official host of this giveaway, so all our hosts’ Facebook pages are included for you to check out. If you’ve never listened to our podcasts, I hope you’ll give us a try and please, subscribe to us on iTunes! If you aren’t into Facebook, you can still enter by clicking on Free Entry. This giveaway ends on Tuesday, September 9. The winner will be selected and notified by email the following day. The winner must respond to their email notice within 48 hours or the prize will be forfeited and another winner selected. Good luck and have fun with this one!